Art Camp is better than ever! Classic themes return with new projects, and we’re adding exciting new themes for adventurous artists. 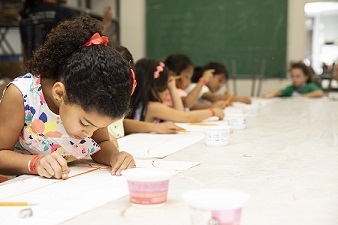 Each week of Art Camp for Kids will feature 2D and 3D artmaking, using a variety of media, which may include painting, drawing, sculpture, ceramics and/or mixed-media. At the Art Center, kids will learn from our talented teaching artists, make amazing projects, and meet new friends in the studio. Art Camp for Kids is for kids ages 5-9, and they will be divided into groups with kids of similar ages. On Fridays of 5-day camp weeks, come celebrate your young artist’s creations during our culminating art exhibition from 2-3PM. You can use THAT to make art? This week of camp answers “yes!” by teaching kids how to upcycle recycled, repurposed, and natural materials into surprising artworks.Kids will create projects such as recycled paper weavings and assemblage sculptures.